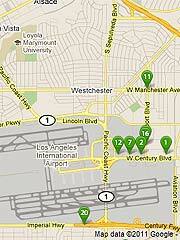 Hotels near the airport terminal entrance, including hotels near LAX under $100 per night. Many offer a free airport shuttle for registered guests. 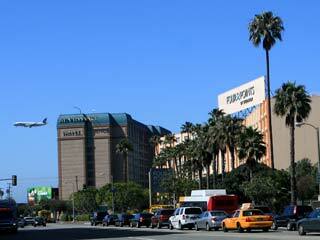 Burbank Airport - Hotels near Bob Hope International Airport in Burbank. There is an Amtrak train station near the airport entrance. This airport is convenient to Hollywood and downtown L.A.
Disneyland - Hotels and Motels near Disneyland and Anaheim Convention Center. Several are within walking distance from Disneyland, and many more are located along the Anaheim Resort Transit (ART) shuttle route, which offers convenient, low-cost transportation to Disneyland. Near Universal Studios - and CityWalk Hollywood. Universal Studios is about a 10-minute drive from Hollywood Boulevard, or you can take the Red Line train. Six Flags Magic Mountain - Hotels and Motels in Valencia and Santa Clarita, near Magic Mountain. Near LEGOLAND - Hotels in Carlsbad and nearby. Some of these hotels have a shuttle to LEGOLAND, and one is adjacent with a private entrance to the theme park. Hotels near SeaWorld - including Mission Bay and Pacific Beach. (Also see Mission Valley/Old Town below for more hotels near SeaWorld San Diego). San Diego Zoo area - including Balboa Park, Hillcrest and North Park. Most of these hotels are reasonably close to San Diego International Airport. (Also see Mission Valley/Old Town below for more hotels near the San Diego Zoo). Safari Park (formerly called the San Diego Wild Animal Park) - hotels in Escondido, within a short driving distance from the Safari Animal Park. The area is also a short drive from LEGOLAND. Fitness Resorts - Resorts, spas and hotels that have actual fitness programs that vary from relaxing spa treatments to intense health training programs. The list includes L.A., Santa Barbara, Palm Springs, Carlsbad and more. Luxury Hotels and Resorts near Beaches - including Santa Monica, Marina del Rey and more. Hollywood Boulevard and the Hollywood Entertainment District, including Hollywood & Highland Entertainment Center, the Walk of Fame, Chinese Theatre and other attractions. Hollywood and Vine is about a mile from there at the eastern end of the Hollywood Entertainment District, where you can find Pantages theatre and the capitol Records Building. Universal Studios - The Hilton and Sheraton are on the hill next to Universal Studios and CityWalk Hollywood. There are more hotels nearby, and all have options for easy access to Universal City and the Metro Red Line train. West Hollywood (Sunset Strip) - Online reservations for hotels near the Comedy Store, House of Blues, Saddle Ranch Chop House, Whiskey A Go-go, Viper Room, The Roxy and Cat Club. The Sunset Strip is about a mile west of the tourist district on Hollywood Boulevard. You'll find a variety of entertainment including comedy, jazz, heavy metal, punk rock and more. The action on Sunset Boulevard continues well into the late hours of the night with club-hopping celebrities, locals and tourists alike. You can use the train to quickly get to tourist attractions in Hollywood, downtown LA and Universal Studios. The rates are lower, and many offer free parking, free breakfast and more. 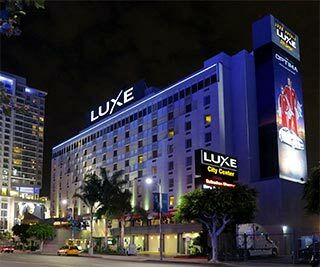 Luxe City Center in Downtown L.A. Downtown Los Angeles - including hotels near Staples Center, LA Convention Center, the Financial District, Union Station, 7th Street Metro Center, Little Tokyo and others. 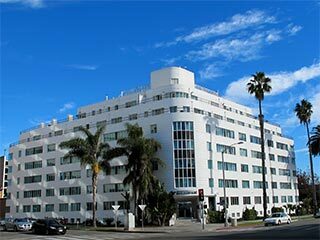 Beverly Hills - Beverly Hills is centrally located to many of the tourist attractions in Los Angeles. It's within a half hour drive from LAX, Hollywood Boulevard, Universal Studios, Santa Monica, Getty Center, Museum Row on Miracle Mile (including LACMA and La Brea Tar Pits), Westfield Century City Shopping Center, Beverly Center shopping mall, Restaurant Row, The Grove at Farmers Market, West Hollywood night clubs, Downtown L.A., UCLA and more. Within Beverly Hills is the world-famous Rodeo Drive shopping district, plus top-tier restaurants and entertainment throughout the city. There is a separate page for 5-star Luxury Hotels in Beverly Hills. Culver City - Near LAX, Corporate Pointe business offices, West LA Community College, Westfield Culver City mall, Howard Hughes Promenade, and also the historic Culver Hotel near Sony Studios. Westwood - Hotels near UCLA and Westwood Village. 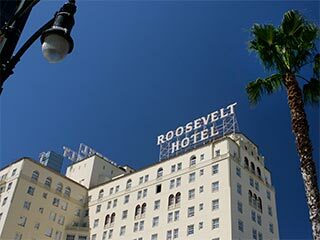 These hotels are also not far from Getty Center, and an easy drive to Santa Monica and Beverly Hills. Westwood Village features several blocks filled with shops, cafes, theatres and more. The location is convenient to the 405 freeway. Santa Monica is less than 30 minutes from LAX by car and offers countless attractions and opportunities for shopping, dining, entertainment and nightlife. Browse stores and boutique shops at the Third Street Promenade, Santa Monica Place and Montana Avenue. You can spend the day exploring the beach, the Pier, Venice Beach and Malibu. Top it all off by dining at one of the dozens of restaurants you can find within a short walk from your hotel. It's a short drive to either the Getty Center near the 405, or the Getty Villa in Malibu. You can take a ride up the coast on Pacific Coast Highway, or walk down the beach from the Santa Monica Pier to Venice Beach boardwalk. Marina del Rey is the beach area that's closest to LAX, and can be reached in about 15-20 minutes by car. The atmosphere is quiet and relaxing. There are various dining options in Fishermans' Village, near Venice Beach on Washington Boulevard, and several high-end restaurants located at various points around the marina. Some hotels are walking distance from Venice Beach. South Bay - including Redondo beach, Hermosa Beach, Manhattan Beach and Long Beach. Orange County Beaches - Hotels and resorts in Newport Beach, Seal Beach, Huntington Beach, Laguna Beach, Dana Point and San Clemente. This area is located between Disneyland and San Diego, and offers many upscale hotels and resorts. Newport Beach, Huntington Beach and Seal Beach are most convenient to Los Angeles from the Orange County beach areas, and located only 15-20 minutes from John Wayne Airport (SNA). Catalina Island - get away for the weekend on Catalina Island. Luxury Hotels in Los Angeles Beach Communities - 5-star and 4.5-star luxury hotels and resorts located in Santa Monica, Marina del Rey and Rancho Palos Verdes. Fitness Resorts - all-inclusive resorts and spas that offer fitness packages that are designed to encourage healthy living, weight loss and stress reduction. Most programs are about a week long although some are only a few days while others can be reserved for a month or longer. Burbank and Glendale - this area is 15 minutes from downtown LA, near Bob Hope Airport (BUR) and many movie and TV studios. Hotels in Pasadena - north east of Burbank. Home of the annual Rose Parade on New Years Day. San Fernando Valley - including Sherman Oaks, Van Nuys, Canoga Park, Northridge, Chatsworth, Calabasas, Agoura Hills and Mission Hills. Antelope Valley - Palmdale and Lancaster. Hotels Outside of Los Angeles - including hotels in San Diego, San Francisco, Las Vegas, Sacramento, Santa Barbara, Oxnard, Ventura, Solvang, Buellton, Pismo Beach, Fresno and many other cities in the United States.